We're in the home stretch. 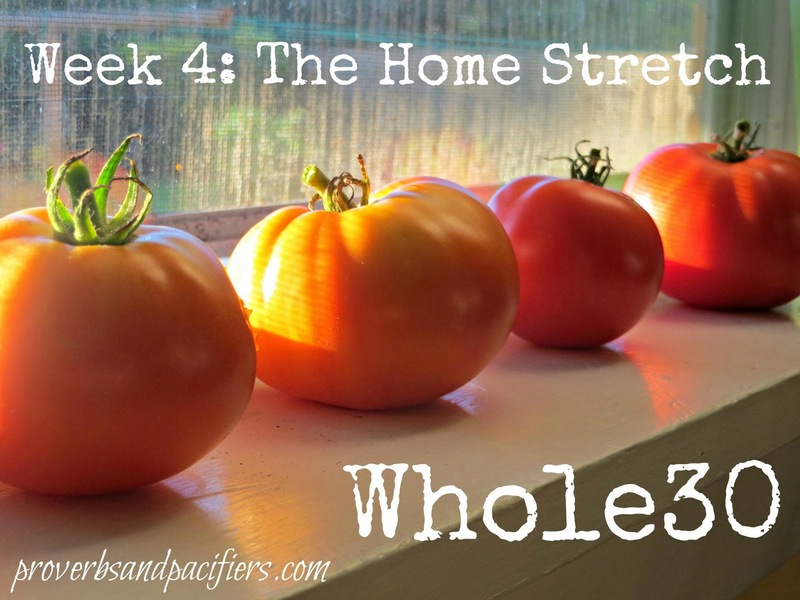 We've successfully completed Week 4, which means we only have 2 days left of our Whole 30. Just two days! And believe it or not, I think these next two days might be some of the hardest. I mean a Whole28 is practically the same thing as a Whole30, right? Kind of like how I can clean the entire kitchen top to bottom and just kind of skip the bottom...who needs to mop when the counters are clean? Or how I can claim that all the laundry is done even though I have a pile of clothes the size of Texas on the couch waiting to be folded and put away. But the laundry is done! Yeah, these next two days are going to be hard for me, but we will make it! Have I mentioned how much I hate accountability? This week for our recap I thought I'd try something fun. Have you seen this article? I shared it on Facebook last week (so if you didn't see it you should go like my Facebook page! ), and thought it was really a neat look at how diet is affected by our culture. 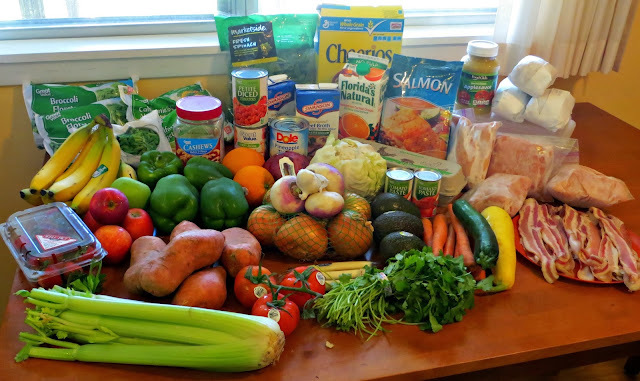 I thought it would be fun to take a picture of what a week's worth of food looks like on our Whole 30. This pretty much represents what a week of groceries have looked like this month. The meat is a little hard to decipher because I had to pull it out of the freezer. We had 4 pounds of chicken, 1 pound of turkey, 3 pounds of ground beef, 1.5 pounds of salmon and 1.5 pounds of bacon. Overall, this spread cost us right at $100 (I did have to go back to the store mid-week for more eggs and bananas). Most of meat was bought on sale, but I did add that into my total. This has actually been the cheapest week on our Whole30 so far, but I think that's because I'm getting better at making the food stretch and using ALL of the vegetables before they go bad. The cheese sticks in the picture are for Rooster (he needs the calcium since he's not drinking milk). The cheerios are for Cupcake just because she likes Cheerios. The applesauce off in the corner is for me. 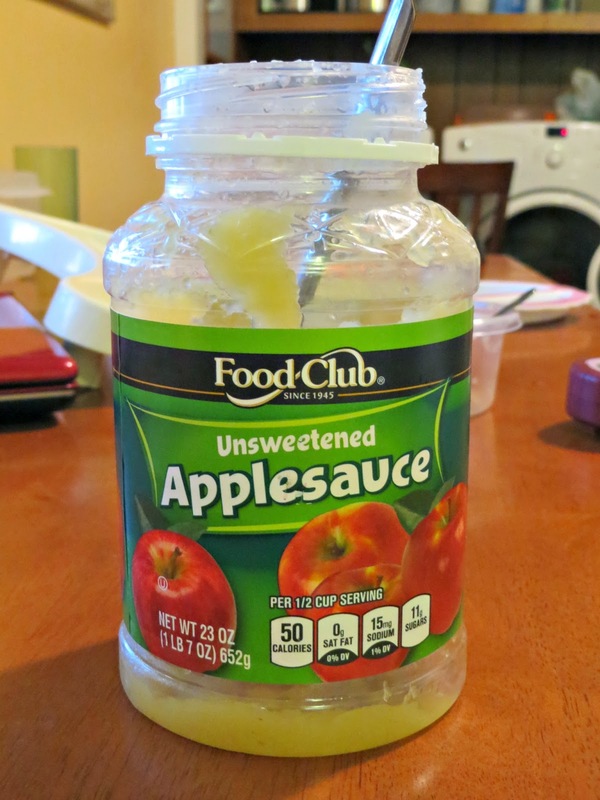 Let's just say that if you put applesauce in the freezer for a bit and let it get really, really cold it practically tastes like ice cream (and only 250 calories for the whole jar!). As we approach the end of our Whole30, I really do have mixed emotions. Yes, I want those food we can't have, but honestly, my must-have list is pretty short. That's it. Of course, pizza would be nice. Mexican would be nice. All of our favorite foods sound good every now and then, but those cravings come and go. In fact, my current short list cravings come and go too. They just seem pretty important right now as I type this post! Once we get past these little splurges, I'm actually pretty nervous about going back to normal. The Whole30 has given me a feeling of control and accomplishment, and I'm afraid I'll feel a little lost without those boundaries. This Whole30 hasn't been convenient. It hasn't been easy. But I like the results. I do feel better about myself and my body. I feel strong and more healthy. I never got the boundless energy "they" promised, but as a pregnant mom with a nursing baby and a toddler I'm thinking boundless energy may be asking a bit too much. I like being confident in that we are eating good food to fuel our bodies. Sugar, artificial ingredients, preservatives, all have a way of sneaking into our diets more than we realize. We say we eat healthy but most of don't realize how loosely we use that word! And the idea of stuffing all the rules on the shelf and going back to life as it used to be really makes me feel out-of-control. We live in a world that is saturated with unhealthy food, and I need boundaries to help me navigate those food choices for me and my family. We're still working on those boundaries. I'm honestly not sure what Day 31 (Wednesday) will look like for our family, except that I'm pretty sure it won't be the day of indulgence I imagined. It will however at least include a little ice cream! For your ice cream craving might I suggest this: http://deliciouslyorganic.net/paleo-chocolate-chip-cookie-dough-ice-cream-grain-free-gluten-free/ We love this and it is soooooo easy. We make the ice cream and also Carrie's "Hershey" chocolate sauce for topping and making chocolate almond or coconut milk. Let's be best friends! I can't wait to try this. I love making homemade ice cream and usually make it myself, but I've not tried something sweetened with honey. It's on my grocery list! 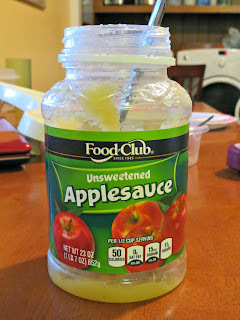 We've recently switched to a whole foods diet for our family! It was hard to make the initial adjustment, but it's gotten so much easier. I'm going to have to try some of those recipes!